Some of my most favorite wedding photos are the ones that are a bit off-center — quirky, campy, unexpected. 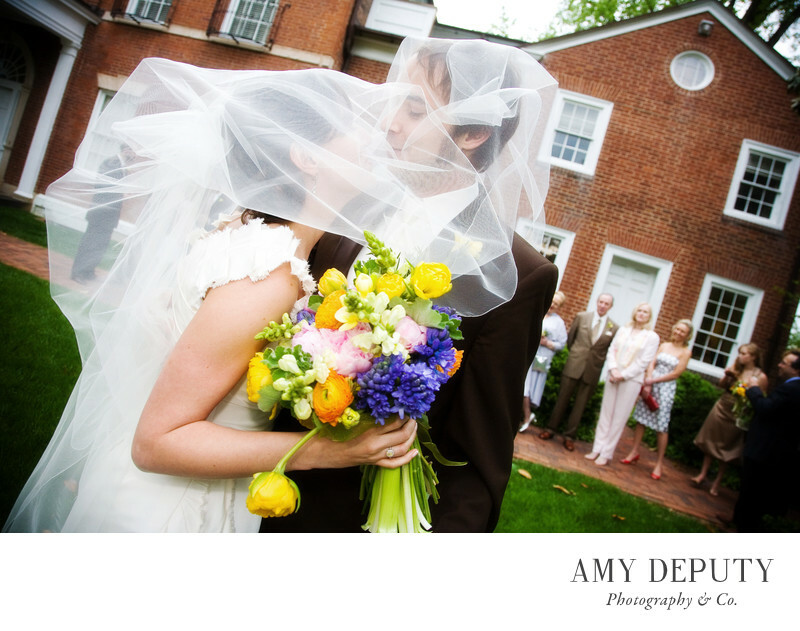 This Dumbarton House wedding photo is just that; it captures a private little moment of intimacy mixed with sweet silliness. . The bride and groom are wrapped in the gauzy mesh of a veil, obscuring their gaze. A wonky yellow flower leans to the side of its bouquet. The family in the background, in front of Dumbarton House, appear tilted, as if they may slide off the frame. I specialize in modern wedding portraits, candid documentary photography, and wedding photojournalism. My work is a playful blend of the classic and the natural; the loving and the quirky. While I love shooting whimsically candid wedding photographs, I always make sure to shoot a series of classically posed photos of the bride and groom, the wedding party, and family groups. The resulting portfolio of wedding pictures is as interesting and beautiful as the lovely brides and grooms themselves. Location: Dumbarton House, Washington, DC.